Directions (Qs. 1 – 4) : A cube is coloured red on all faces. It is cut into 64 smaller cubes of equal size. Now, answer the following questions based on this statement :How many cubes have no face coloured? Directions (Qs. 1 – 4) : A cube is coloured red on all faces. It is cut into 64 smaller cubes of equal size. Now, answer the following questions based on this statement :How many cubes are there which have only one face coloured? Directions (Qs. 1 – 4) : A cube is coloured red on all faces. It is cut into 64 smaller cubes of equal size. Now, answer the following questions based on this statement :How many cubes have two red opposite faces? Directions (Qs. 1 – 4) : A cube is coloured red on all faces. It is cut into 64 smaller cubes of equal size. Now, answer the following questions based on this statement :How many cubes have three faces coloured? How many cubes will have one face painted only in Blue? 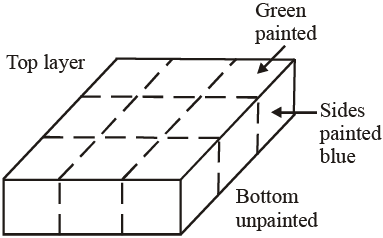 In the top layer, the central cube has only one face painted green, the four cubes at the corner have three faces painted one face green and two faces blue. The remaining four cubes have two faces painted one green and one blue. 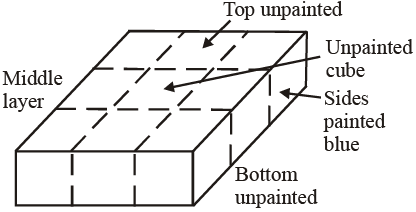 In the middle layer, the central cube has no any face painted, four cubes at the corners have two faces painted blue and the remaining four cubes have one face painted blue. In the bottom layer, the central cube has one face painted green and four cubes at the corners have three faces painted–two blue and one green. The remaining four cubes have two faces painted-one blue and one green. There are four cubes in the middle layer which have one face painted only in blue. How many cubes will have one face painted only in Green? There is one (central) cube in the top layer and one (central) cube in the bottom layer which have one face painted only in Green. How many cubes are formed in all? 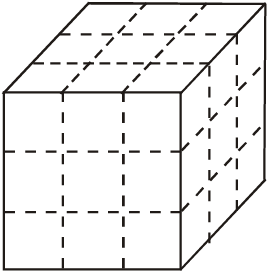 There are 9 cubes in each of the three layers. Thus there are 27 cubes in all. How many cubes will have at least three sides painted? How many cubes will have no face painted at all? Only one central cube in the middle layer has no faces painted at all. Directions (Qs. 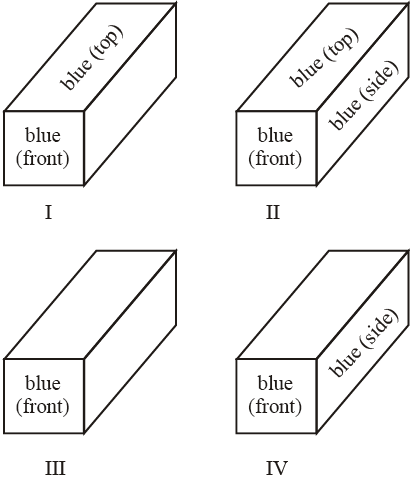 10-12) : Three adjacent faces of a cube are coloured blue. The cube is then cut (once horizontally and once vertically) to form four cuboids of equal size, each of these cuboids is coloured pink on all the un-coloured faces and is then cut (as before) into four cuboids of equal size.How many cuboids have two faces coloured pink? 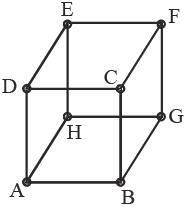 The adjoining figure shows the cube coloured and cut into four cuboids as stated in the question. Now, all uncoloured faces of each cuboid are coloured with pink and then again cut each cuboid into four cuboids. In set I and IV : 2 cuboids have 2 faces blue, 2 faces pink and 2 faces uncoloured each. 2 cuboids have 1 face blue, 3 faces pink and 2 faces uncoloured each. In set II : 2 cuboids have 2 faces blue, 2 faces pink and 2 faces uncoloured each. 1 cuboid has 3 faces blue, 1 face pink and 2 faces uncoloured each. 1 cuboid has 1 face blue, 3 faces pink and 2 faces uncoloured each. In set III : All the four cuboids have 1 face blue, 3 faces pink and 2 faces uncoloured each. There are 2 cuboids in set I, 2 cuboids in set II and 2 cuboids in set IV having 2 faces pink in each. Thus, there are 2 + 2 + 2 = 6 such cubes. Directions (Qs. 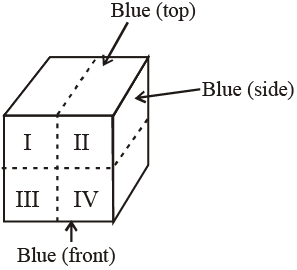 10-12) : Three adjacent faces of a cube are coloured blue. The cube is then cut (once horizontally and once vertically) to form four cuboids of equal size, each of these cuboids is coloured pink on all the uncoloured faces and is then cut (as before) into four cuboids of equal size.How many cuboids have three faces coloured pink? There are 2 cuboids in set I, 1 cuboid in set II, 4 cuboids in set III and 2 cuboids in set IV having 3 faces pink each. Thus, there are 9 such cuboids. Directions (Qs. 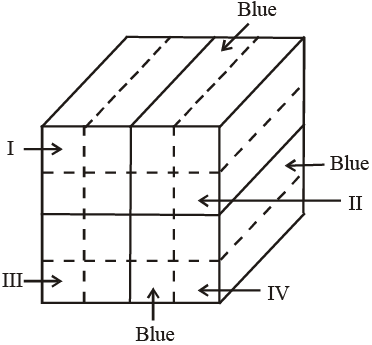 10-12) : Three adjacent faces of a cube are coloured blue. The cube is then cut (once horizontally and once vertically) to form four cuboids of equal size, each of these cuboids is coloured pink on all the uncoloured faces and is then cut (as before) into four cuboids of equal size.How many cuboids have three faces coloured blue? There is only one cuboid having three faces blue. 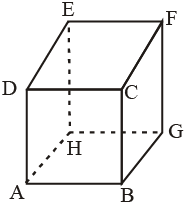 This cuboid lies in set II. Directions (Qs. 13-17) : A cube painted red on two adjacent faces and black on the faces opposite to the red faces and green on the remaining faces, is cut into sixty-four smaller cubes of equal size.How many cubes are there which have no face painted? Faces ABCD, BCFG are painted with red. Faces ADEH, EFGH are painted with black. Faces CDEF, ABGH are painted with green. In Layer I : Four central cubes have only one face painted green, four cubes at the corners have three faces painted red, green and black. Out of the remaining 8 cubes, four cubes have two faces painted red and green and four cubes have two faces painted black and green. 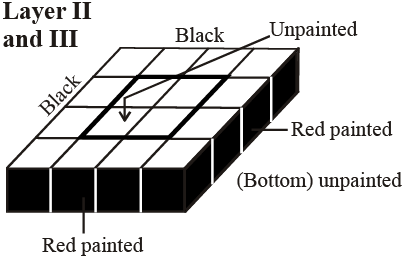 In Layer II and III : Four central cubes have no faces painted, four cubes at the corners have two faces painted red and black. Out of the remaining 8 cubes four cubes have only one face painted black and four cubes have only one face painted red. In Layer IV : Four central cubes have only one face painted green, four cubes at the corners have three faces painted red, green and black. Out of the remaining 8 cubes four cubes have two faces painted green and black and four cubes have two faces painted red and green. There are 8 cubes having no face painted. Directions (Qs. 13-17) : A cube painted red on two adjacent faces and black on the faces opposite to the red faces and green on the remaining faces, is cut into sixty-four smaller cubes of equal size.How many cubes have only one face painted? Directions (Qs. 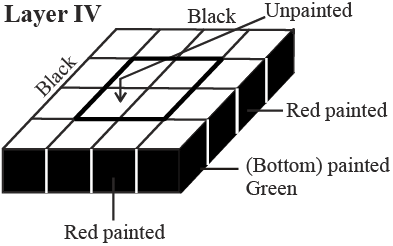 13-17) : A cube painted red on two adjacent faces and black on the faces opposite to the red faces and green on the remaining faces, is cut into sixty-four smaller cubes of equal size.How many cubes have less than three faces painted? There are 24 cubes having only one face painted and 24 cubes having only two faces painted. Directions (Qs. 13-17) : A cube painted red on two adjacent faces and black on the faces opposite to the red faces and green on the remaining faces, is cut into sixty-four smaller cubes of equal size.How many cubes are there with three faces painted? Directions (Qs. 13-17) : A cube painted red on two adjacent faces and black on the faces opposite to the red faces and green on the remaining faces, is cut into sixty-four smaller cubes of equal size.How many cubes have one face green and one of the adjacent faces black or red? Cubes with one face green and one of the adjacent faces black or red = 8 (Top Layer) + 8 (Bottom Layer) = 16. 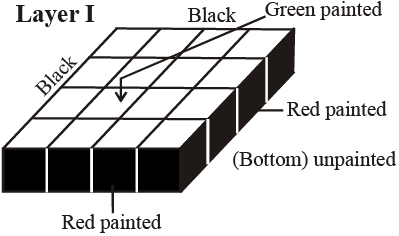 A cube is painted red on two adjacent faces and on one opposite face, yellow on two opposite faces and green on the remaining face. It is then cut into 64 equal cubes. How many cubes have only one red coloured face? Let faces ABCD, ABGH and CDEF are painted with red colour. Faces BCFG and ADEH are painted with yellow and EFGH is painted with green colour. Clearly the cubes which have only one red coloured face and all other faces uncoloured are the four central cubes at each of the three faces ABCD, ABGH and CDEF. Thus, there are 4 × 3 = 12 such cubes. 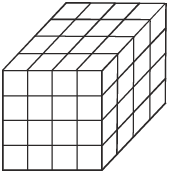 From a 10 × 10 × 10 cube, which is formed by combinations of 1 × 1 × 1 cubes, a layer of the smaller cubes is removed. What will be the number of 1 × 1 × 1 cubes present in this new cube? width = 10 – 1 – 1 = 8. = 8 × 8 × 8 = 512. A 5 × 5 × 5 cube is formed by using 1 × 1 × 1 cubes. If we add another layer of such 1 × 1 × 1 cube in the 5 × 5 × 5 cube. What will be the number of 1 × 1 × 1 cubes in the newly formed cube? width = 5 + 1 + 1 = 7. = 7 × 7 × 7 = 343.